I've been playing around with AL on my NUCs for the last week. It's been great fun learning a bit about Linux, digging into the BIOS, and of course listening. * My progression on CA started with a basic CAPS server. Played around with adding a better USB and a decent R-Core 12V LPS off eBay. Used JRiver is a single box configuration with music on my Synology NAS. * Next step was to move to a "two box" approach -- putting Minimserver and BubbleUPNP on my NAS, using JRiver as a simple endpoint. * Next, replaced the CAPS with a NUC6i5 and a fanless case, ultimately buying AO and Fidelizer (still using Minimserver on my NAS). * Finally, added Roon and Dirac Live, installing ROCK on a NUC7i5 (with another LPS off eBay) to be the server. That left the NUC6i5 as the endpoint running Win 10 / AO / Fidelizer / Dirac / Roonbridge. This has sounded fabulous to me. My signature shows the rest of my gear -- nice stuff, but clearly at the lower end of the high end. In trying AL, I wanted to see what stripping everything down to the bare minimum would do. First put AL on the NUC6i5 running Roonbridge. Stripped down the BiOS as has been recommended, running in memory, Extremed mode, etc. The difference between AL on the endpoint and the Win 10 setup was clear -- AL put sharp edges around everything, clearly delineating instruments in the soundstage (which I liked). In some ways, the soundstage seemed deeper, too. Unfortunately, I also lost some low end energy and, more importantly, lost the lushness and beauty of the Win 10 / AO / Fidelizer / Dirac setup -- strings particularly were sharp and edgy. To get the full AL experience, I also got a fanless case for my NUC7i5, increase RAM to 16g, and set up AL as the Roon core, doing all of the optimizations I did on the endpoint. The difference in doing this was much more subtle, mostly providing a bit more of the etched sound that AL on the endpoint started. As much as I wanted to love AL, for now I've gone back to my Win 10 / AO / Fidelizer / Dirac configuration for the endpoint. I've got the lushness and beauty back, and the great benefits of Dirac. I'm keeping AL on the NUC7i5 as the server, allowing me to keep some of the clarity it provides. I know we all hear differently, have different equipment, and of course different rooms. I'm game to make more changes to make AL work, but I'm not sure where to start. Would love thoughts, recommendations, opinions. Thanks! What you are reporting correlates to what others have heard, I suspect it may be related to the DAC used as well, still have to try it. Now I have too many nucs and devices. I hope this makes sense. It is a bit complicated. Hi Larry. Just trying to get clear on your wireless setup. Tidal Streaming only: ATL DC Blocker > Topaz 2.5Kva Isolation Transformer > Sine SA5 Cryo 5 power strip > Aqvox 8 port network switch > NUC Roonserver (16gb Audiolinux Headless RAMboot, Akasa Fanless case) NUC Roon endpoint (4gb Audiolinux Headless RAMboot, Akasa Fanless case) > USPCB>ISO Regen>Battery powered> PS Audio Directstream Junior Dac > Decware SE84UFO3 Mono Amps > Omega Super Alnico Monitors. Actually it is much simpler. You have the endpoint right, it's 5ghz wireless to the extender. Now draw a solid line(wired cat6) to the server from the extender. A laptop also connects wirelessly for control purposes. Lastly a second 5ghz radio runs to the router on the first floor for internet. That's it. I have no switch. How do you power the extender? Are you using the supplied or have you diy’d a clean voltage? The extender is powered with a 13.5 volt sigma 11 lpsu and with two 12 volt 1 amp ldovr lt3045 cards connected in parallel to deliver 2 amps of current. It won't run on 1 amp. The extender is a two 5ghz radio Linksys re9000. The 2.4ghz radio is disabled. Various lpsu configs were tested and this sounds best. FWIW, there is also an Emosystems isolation transformer between the server and extender. On another topic, Rickca did some research and learned it was better to power the 4 port Startech USB card at 12 instead of 5 volts. Rick was right. The SQ jump is substantial. If you have one if these Startech cards this tweak is highly recommended. I'm using a Hdplex 200 watt lpsu and it's lt3045 output at 12 volts and running that directly into the card via sata connector. Larry, you completely lost me - what does the Startech card do in your system ? Between, for folks who are using wired Ethernet the GigaFOILv4 with active isolation seems like an awesome tweak. I haven't tried it but in some forums, folks with MSB renderer have noticed a significant improvement with it. On my custom Audiolinux server the 4 port Startech connects the motherboard to my two music sources, a usb 3.5 inch hdd and the internet via my wifi extender. It also pushes a bit stream to the nuc endpoint. When I got home I was trying to visualise this (being in the design business and looking at pictures all day ) and still am not quite clear. So is it A or B? Thanks! Wireless extender = one or more WirelessAccess Point(s) + Switch in one box. Wireless router = Wireless extender + Wired router in one box. I see, Thanks. I'm asking as I'm trying to work out how I can make use of what I have on hand. Technically I have a range extender plus a separate Aqvox switch (which when added gave one of the best improvements I've had). If you can draw what you have in place today (current state) along with any physical restrictions requiring a wireless link, it would be straightforward to make any suggestions for improvements (future state). If you have unused network gear on hand as well, please provide that list. Finally the ALSA RAVENNA/AES67 Driver and daemon is out! Here you go Larry. The NUCs are powered by Paul Hynes SR4 and the Switch and router by modified Teradak LPSUs. 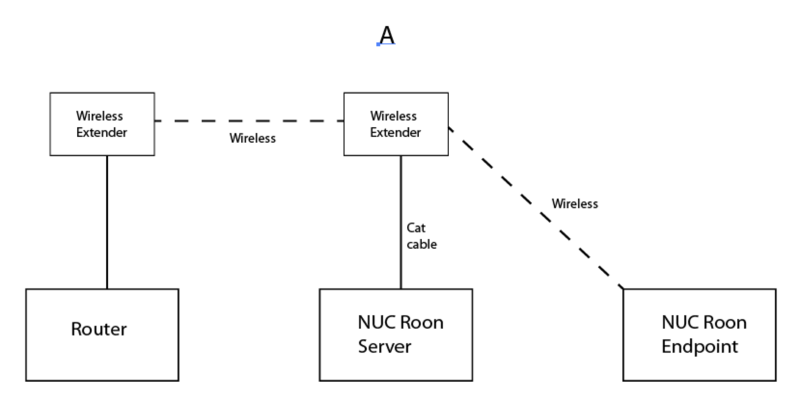 I suppose I could replace the cable between Router and NUC Roon server with the wireless range extender, but don't see how I can send wireless to the Endpoint without a more sophisticated Wireless extender hanging off the switch. There aren’t any other physical restrictions. Thanks so much for having a look! I must say the SQ is superb with recently adding bridging and the latest AL updates using CPU/core isolation on the server. Well one can take network design to great lengths. Here are several simple approachs and I am sure others may have different ideas for you. 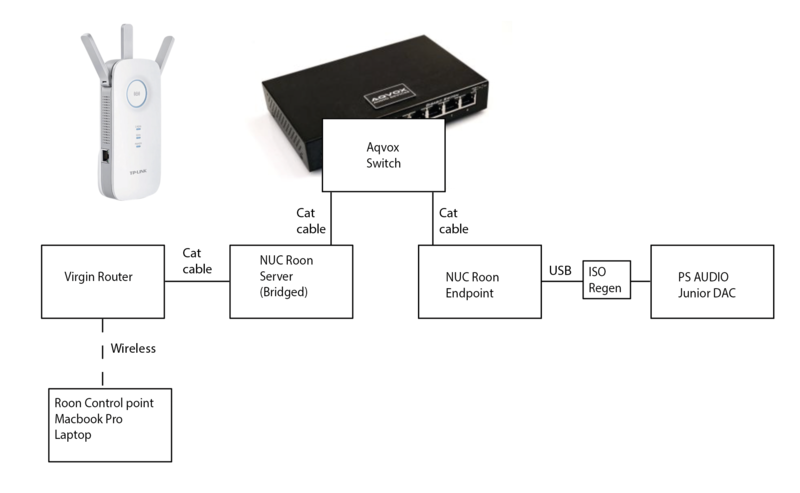 1) You could duplicate what is happening here and replace the Aqvox switch with a 5ghz wifi extender with one radio connected to your virgin router, and the second connected to your NUC and laptop all at 5ghz, (if your virgin router supports 5ghz). This assumes your NUC has a WiFi card or that one can be made available. This assumes you disconect the cable between your server and router. The server is cabled to the extender in this design. 2) Simply get a WAP for the server and setup a link to the router, hopefully at 5ghz. Older routers often can be setup in this mode. 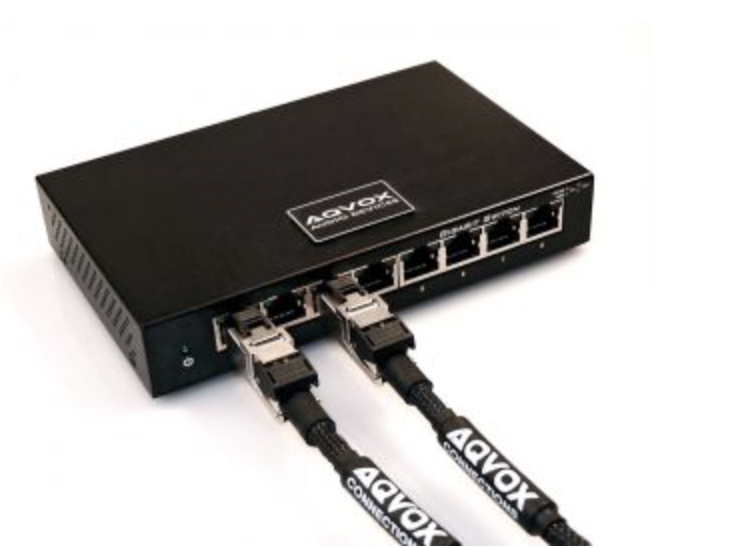 3) Get a second Aqvox or someday a EtherRegen and place it between the router and server. All three of these designs rid your system from the noise coming from that virgin router and cable from the street. If someone can test Horus or Hapi with this new driver on AudioLinux, it would be great. I would be particularly interested to hear about its routing capabilities compared to its Win/Mac counterpart. Have you tried the core isolation on the endpoint as well? What effect did it have on the SQ of the server? Hopefully this weekend I'm going to add core isolation on my endpoint to. I tried but didn't work so I've ordered another 4gb ram to see if that will solve it. The core isolation on my server added a small improvement but interestingly also added several second delay before music plays after pressing the play button. I also set up bridging on the server which added an improvement too. Thanks Larry! Indeed there are many ways to skin this cat.. I'll have a think and see which direction I will try out. Probably no. 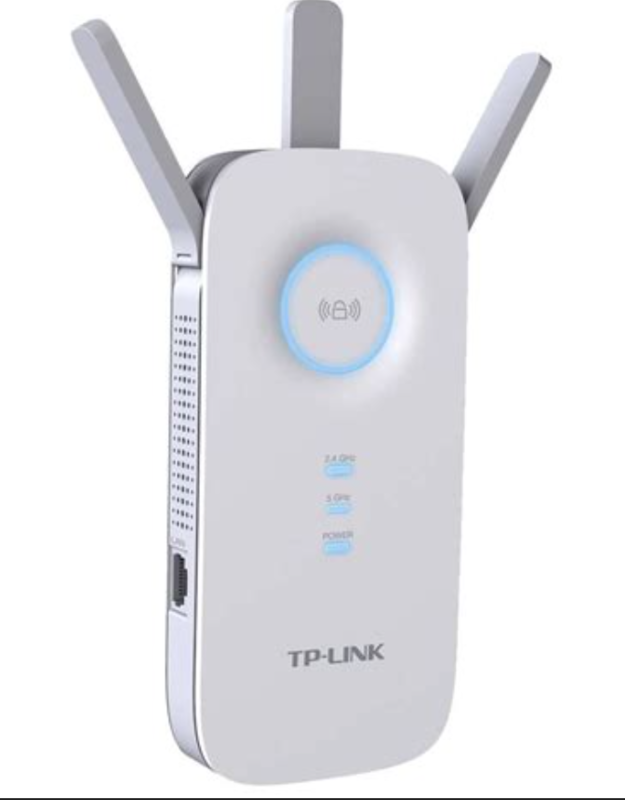 2 as I'm going to wait for Uptone switch before buying any more network gear and I already have the TP Link range extender which will fit with my router. I did have the switch between the router and everything else up until recently when I tried bridging on server after noting @austinpop reminder recently. When I initially added the Aqvox switch a year or so ago it was a major improvement over all. Moving it to where it is now (bridging server and endpoint) didn't really degrade the sound but improved it (probably because of the bridging), so I'm curious what a wireless link between router and server can do. To add, when I changed the power supply on the Router this also had a significant improvement. My whole system is on a big Topaz isolation transformer. Option 2 will eliminate the "street noise" from the server and another potential ground loop which should give you a nice bump in SQ again. Plus it is a free option. Once done, it is easy to swap the extender for the switch, again with the assumption that you have a WiFi card for the endpoint. The Linux setup for wifi is the tricky part with this approach. Hmmmmm... interesting...how much RAM do you have on your server with the isolated cores working? Are you running roon server? My server has 8gigs of RAM and I was wondering if that was the reason I couldn't get roon server started after I originally got the cores isolated... I'll have to give it another try when I get enough time but I hope 8gig will be enough... I only have 4gig in my NUC7CJYH running roon bridge so I guess that's a no-go from your experience? Yes there is a wifi card in the endpoint (and server) which I have currently switched off in Bios and blacklisted. I hope to give Option 2 a go soon, when I can find the time... :). Cheers Larry, thanks for the input. I have 16gb ram on my bridged NUC server and yes I'm running roonserver with isolated cores. Piero suggested more ram on the endpoint, so I'm adding another 4 to make 8gb this weekend. Then I will try again with isolate cores. I have now managed to get the isolated CPU cores working with 8gig of RAM with ramroot still working and running roon server. The CPU in my sonicTransporter i5 is the 5200u. Initial impressions are a higher resolution sound with better image focus and textures, more space around the image and less compressed. It also sounds lower noise, smoother and more engaging. There is less bleeding between images and everything sounds cleaner in a natural way not a sterile way.